You Are Here: Home > Now Open in Ridgeland! Now open at 455 Steed Road in Ridgeland, MS.
Our brand new, state-of-the-art facility opened in November of 2017 and features Mercedes-Benz Autohaus design specifications and standards throughout. Our new location is all about style, customer service and comfort. 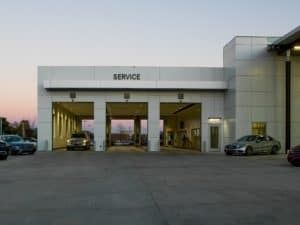 Built from the ground up, the dealership is a beauty with a sleek design, a showroom with an all-glass front and soaring ceilings and technology to make service more efficient. 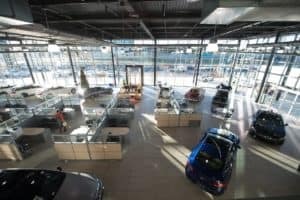 The new showroom features and open floorplan and floor-to-ceiling windows. We can accommodate 20 vehicles and have a specific AMG® section, as well as an area with vintage Mercedes-Benz vehicles. You’ll feel like you’ve travelled into the future when you enter our Service area. Upon your arrival, an infrared machine scans your vehicle and notifies us of your arrival. It also determines the wear of your vehicles tires and if there are any alignment issues. We’ve gone to great lengths to provide the most efficient technology. With 42 Service Bays, we can now service more than 2x’s the vehicles we could before. 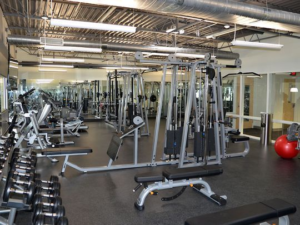 We offer 4 Customer Lounges throughout the facility to ensure you are comfortable and able to work, relax or even exercise while you are visiting us. Enjoy a beverage or snack from our Coffee Bar, sit back and relax in our Service Lounge, let the kids play in the play room or even head upstairs to the full gym! We also offer an area with high-speed internet and work stations. Our goal is to make you as comfortable as possible while you are with us.